We’re delighted to announce that you’ve done it again, with two new planet hunters discoveries being announced at the 219th meeting of the American Astronomical Society meeting in Austin, Texas today. Both of these were missed by standard procedures and have only been found because of the efforts of volunteers. Both of these were sequences of transits that were picked up by planet hunters volunteers, both using the main site and via Talk, and we’ve done enough work that we’re confident that they’re real. They thus become the third and fourth planet candidates to be discovered by Planet Hunters. Congratulations to those involved both on Talk and in the interface. Preliminary work indicates that the first, around the star KIC 4552729, has a 97.5 day period and is approximately 4 times the radius of the Earth. Its transit was caught amongst Quarter 2 data, and we’ve confirmed that it repeats in later data. We can’t quite call this a planet yet, but with more than 95% certainty in our discovery it becomes an official planet candidate. The second candidate is even more exciting. It orbits around the star KIC 10005758, has a 284 day period and is just 3.3 times the size of the Earth. 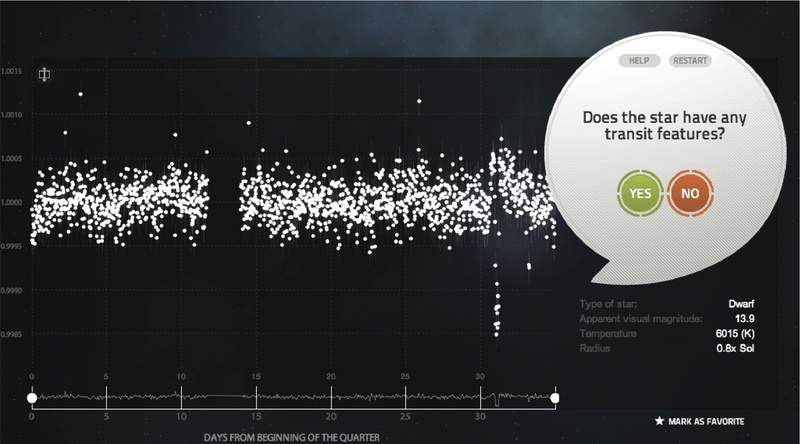 The first transit was caught in Quarter 2, and analysis by the Kepler team caught another, larger planet, closer to its star and orbiting it every 132 days. Not only is it exciting to have the first Planet Hunters multiplanet system, but this makes it much more unlikely that we’re being fooled by a background eclipsing binary. Lubomir Stiak, Kian Jek, Robert Gagliano, Pamela Fitch, Dr Johann Sejpka, Jari Paakkonen, Gregoire P.A. Boscher, Matthew Lysne, Thanos Koukoulis, Andre Engels, Ben Myers, Daniel Posner, Terrence Goodwin, Theron Warlick, Charles Bell, ‘damalimaan’, Sean Parkinson, Samuel Randall, Eduardo Mariño, Frank Barnet, Terrence Goodwin, Ewa Tyc-Karpinska, Heinz W. Edelmann, Lynn van Rooijen-McCullough, Gary Duffy, ‘kamil’, Branislav Marz, ‘Adnyre’ and Colin Pennycuick. If you’d like to join them as discoverers of planet candidates, then keep clicking at Planet Hunters – there must be more in there to find, and we have new data coming shortly to keep you all busy! Chris & the Planet Hunters team. PS I’m struck in looking through that list of names as to how international the Planet Hunters community is. I’d like to thank Lech Mankiewicz and his team who led the charge to make Planet Hunters available in other languages. Congratulations to the Zooniverse team and all PH project contributors–very exciting news! I’m so proud to search for new worlds in real with all of you ; thanks to all of the professional and citizen astronomers. These are wonderfull discoveries ! And if KIC 10005758 is real 0,8 time our sun, the candidate planet should be in the habitable zone, isn’t it ? It should be as the Kepler 22b super-earth, but biggest ! Regarding the roll of honor name ‘damalimaan’, I added my real name to my account settings, so you can add my real name to the list. Wonderful! Congratulations to you all! If I click on the URL link of these two stars, from above, it does not take me to these two stars, is that an error? – I was interested in data on these two stars. The links above direct to the “object” page instead of the star’s page. 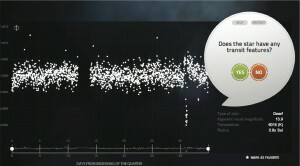 (An “object” is a specific slice of data–in the form of a lightcurve–from a star observation that we looked at.) You can view an object’s star by clicking the “Examine Star” link below the thumbnail graphic. I think Chris did mean to link to the object pages — not the star pages. But I agree that the wording could have been clearer. Je comprend que vous avez découvert 2 nouvelles planètes du type tellurique et je vous félicite.